Leader of the Guardians of the Galaxy, Starhawk is a cosmic powerhouse who was merged with his wife Aleta while exploring the forbidden temple of the extraterrestrial Hawk-God. The first thing I did was mix up some resin and build up the boots, earpieces and gloves. Once those were dry, I sanded them all down till they were smooth. Next, I cut some clear, flexible vinyl for the belt and head-wings while making a star shape for the buckle. I then took some hard vinyl I cut away from some blister packs and started on the larger back-wings. Once you cut a shape you're happy with, trace it onto the other piece so they match. (Scissors work best for this) I then cut some slits into the back torso and the back of the legs for the wings to slide into. This makes it much easier to get the wings to stay in place once you've glued them on. 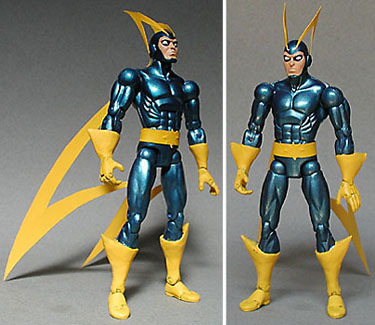 Next, I started painting the figure using Tamiya flat yellow and Tamiya metallic blue for the costume and Tamiya flat flesh and flat white for the face and eyes (use flat black to outline the eyes). This figure does not get a coat of Dullcote - the paint's natural metallic shine suits the character perfectly. When will the Guardians of the Galaxy get the update they so rightly deserve? Tell us on our message board, the Loafing Lounge.